This photo of a man in hazmat spraying a vineyard has occasionally been used in articles about glyphosate. The chemical in the photo is NOT glyphosate. Read on to find out why. On March 24th, Moms Across America posted study results commissioned by an unidentified fan, claiming that 10 California wines all tested positive for glyphosate, including organic wines. Aside from being implausible from a scientific standpoint, there are also certain impracticalities involved, which I’ll discuss in a moment. The published material does not identify the wines, or address the chain of custody. 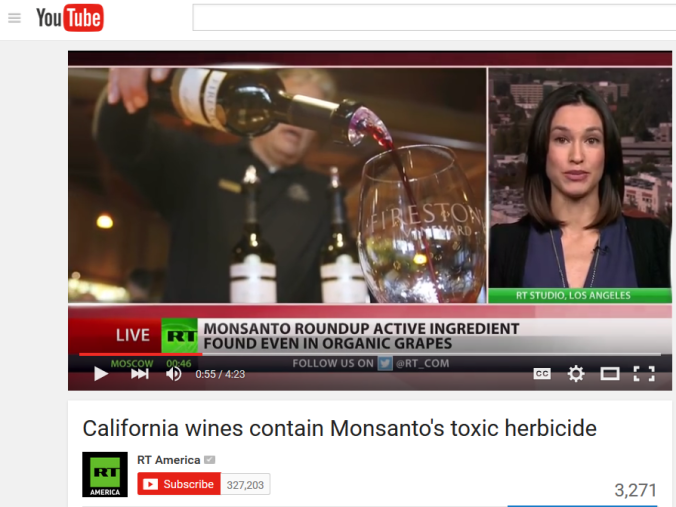 Also, MAA claims all the wines are from northern CA (Napa, Sonoma, Mendocino), yet the wine featured prominently in a video produced by RT America— Firestone—is from Santa Barbara. Moms Across America is an organization devoted to inspiring moms to feed their families healthy, pesticide-free and GMO-free food. I wrote to Moms Across America, requesting a copy of the full report. I received a response a little over a day later, from Natalie, promising that founder Zen Honeycutt would contact me when she returns from traveling next week. Apparently the ladies, other than Honeycutt, do not use last names on the website.